Believe it or not, I was actually listening to Michel Martin, NPR’s Tell Me More (TMM) host and Marilyn Geewax, NPR’s Senior Business Editor tell me why 3 million young people, like myself, are missing from the housing market when I got a text telling me NPR was canceling TMM, their daily news show created to appeal primarily to an audience of color. TMM was created in 2007, but I was directed to it in 2008 when I was searching for public radio stories that spoke to my experiences. And now I’ve come to depend on hearing Martin, Geewax, civil rights attorney Arsalan Iftikhar on the Barbershop, Maryland state delegate Jolene Ivey on the Parents Roundtable, and yes, even Republican strategist Ron Christie, on a daily basis. As a public radio junkie, TMM gave me countless perspectives I don’t get anywhere else. There are a total of 268 NPR Members that operate 835 stations. Member Stations are independent, locally owned and operated broadcasters. Several programs that NPR distributes are produced by NPR Member Stations, not NPR. And original programming from NPR is aired on 987 stations. In 2004 when I was a senior in high school, I participated in Radio Rookies, a program hosted by my local NPR affiliate, WNYC that taught young people to produce radio documentaries. I produced a story on not having a legal status in America, even though I’ve lived here since I was a baby and the experience of not simply telling my story, but hearing it on the radio, and ultimately winning a Peabody award for it, validated my perspective and told me my experiences were newsworthy. But as a college intern in WNYC’s newsroom, my Peabody award winning-behind was starting to lose confidence. Counting all the people of color in the newsroom at that time: Black, Hispanic, and South Asian there were a total of three people of color. And none of them had “Senior” in front of their title, with one notable exception: Maxie Jackson. Jackson, who is now a Public Media Consultant for his own company, MaxWorx Media, was Senior Director of Program Development at WNYC from 2007-2010. During that time he became my mentor, and was the person who directed me to TMM and News and Notes, two NPR programs at the time with Black female hosts that were “expressly designed to have a primary appeal for African-American listeners and other people of color.” News and Notes was canceled in 2009. TMM will be off the air on August 1, 2014. I called him Wednesday, the day after the TMM’s news was announced. “My first reaction was disappointment,” he told me. “This is the third time NPR has attempted this without being successful.” In addition to TMM and News and Notes, Tavis Smiley has a weekly show that he took to Public Radio International (Pri), a rival public broadcaster after clashes over money. It isn’t that there aren’t other important shows featuring Black voices on NPR stations. One such program is Snap Judgment, a storytelling show that airs on NPR, and that’s hosted and created by Glynn Washington, who also happens to be a Black man. Then there’s Audie Cornish (Black woman), a journalist and a current co-host of NPR’s All Things Considered. But across public radio there is nothing else that does, what TMM does – report national and international news daily hosted a Black woman (shoot any person of color), with as much editorial control as Michel Martin. Public radio relies heavily on listener support. In fact individuals make up 39% of their yearly budget, with corporations, the next largest group, making up less than half that number. And lets face it: traditionally the public radio audience has been very old and very White. But things have changed. In April, Nielsen reported that 244.4 million Americans, “nearly 92 percent of Americans 12 or older” are listening to audio programs each week. This is a new record made possible by an African American and Hispanic listenership. Alongside the national growth, African American and Hispanic listenership has also reached a historic high, as more than 71 million from these demographics tune in each week. Combined, these listeners account for nearly a third (29.6%) of the total national audience. These multicultural audiences are highly engaged with radio all across the country, in markets large and small, where more than 3,000 different stations program to them specifically. NPR’s TMM audience was reflecting this shift. In an email from Keith Woods, Vice President of Diversity in News and Operations at NPR, I was told TMM’s listeners are 80% white and 20% people of color vs. roughly 90% white and 10% people of color for NPR’s Morning Edition and All Things Considered. So again, why cancel a show pulling in a growing demographic, instead of 1) using this moment as an opportunity to go after major donors of color and 2) using these facts to get more member stations to air TMM, which would bring revenue to NPR? Kinsey Wilson, NPR’s executive vice president and chief content officer, told Journal-isms in a telephone interview that “while economics was not the sole driver of the decision, TMM was a $2.1 million a year operation that was losing $1.5 million annually. A show such as Fresh Air was raising 28 percent more — via corporate contributions, programming fees from member stations and philanthropic and foundation support — than it cost. I wish I could say this made me hopeful for the state of people of color in public radio across the board– meaning audience, reporters, producers, and MOST importantly senior staff (because they make final decisions about programming and hiring)– but it doesn’t. Martin will go from hosting and having full editorial control of a daily show, to contributing and appearing on NPR’s newsmagazines shows, online platforms and in public events. For me, Michel Martin’s TMM was for NPR what Shonda Rhimes is for ABC, inclusion on an institutional level. Both Martin and Rhimes are highly capable, talented, and qualified women, who also happen to represent the audience their organizations are trying to reach. NPR’s new Code Switch, a team that looks at how an increasingly multi-ethnic America understands itself through a combination of radio stories spread across NPR shows and a blog with a substantial Twitter/Facebook presence, feels more Issa Rae and The Mis-Awkward Black Girl. Both groundbreaking and important work, but not the same, not by far. All this said, ‘can I just tell you,’ I am sad that Michel Martin will no longer have this platform. The complexes of the topics she covered and the way she shaped the conversations showed that every episode was a labor of love. This is a sad moment not just for Martin and her fans, but for the public radio world—one that will not reflect the increasingly brown face of this country if important voices of color continue to go off the air. 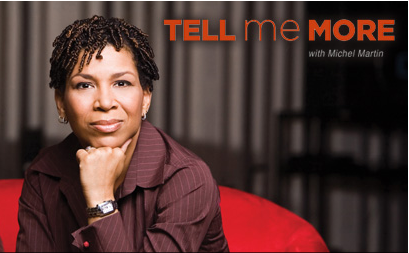 I’m very saddened to hear that NPR is canceling Tell Me More. While I once loved listening to NPR, many of the editorial decisions made over the past decade has dismayed me to the point that I can no longer listen or support its programming. Michel Martin is one of the best host in all of media and I will miss hearing her mediate conversations across a wide range of topics.